FOX's new comedy Making History is created by Julius Sharpe and produced by Phil Lord and Christopher Miller (The LEGO Movie, 21 Jump Street, The Last Man on Earth). 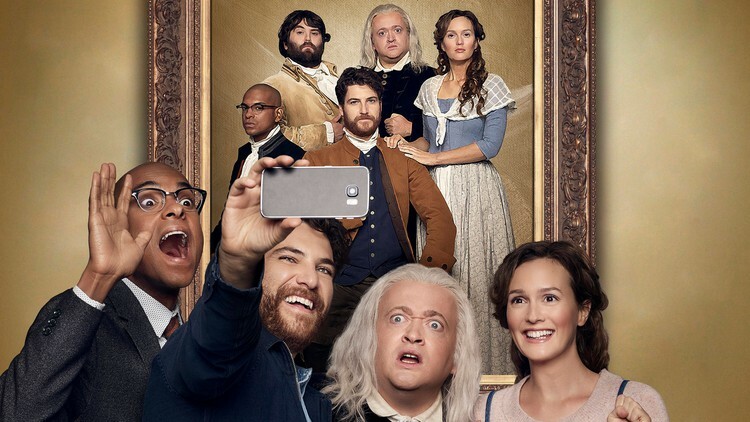 Upon discovering time travel, Dan (Adam Pally, The Mindy Project), a facilities manager at a small Massachusetts college, begins transporting himself back to the 1700s and eventually falls for a colonial woman – but his actions in the past are messing up the present. That woman isn’t just any woman, she’s Paul Revere’s daughter, Deborah (Leighton Meester, Gossip Girl), and Dan’s meddling causes her father to delay his famous ride, which may have altered the outcome of the entire American Revolution. To set matters right, Dan enlists the help of a brilliant, polished, and popular history professor at the college, Chris (Yassir Lester, Key and Peele), who’s now given the incredible opportunity to actually live the history he teaches. Can Dan, Chris, and Deborah save America as we know it? Can a woman from 1775 adapt to life in 2017? Can the three intrepid time travelers improve the past, help the helpless, fight for justice, and find true love and friendship? In Canada the series airs Sunday nights on City. See our City TV guide for more information about watching City content for free on their website.